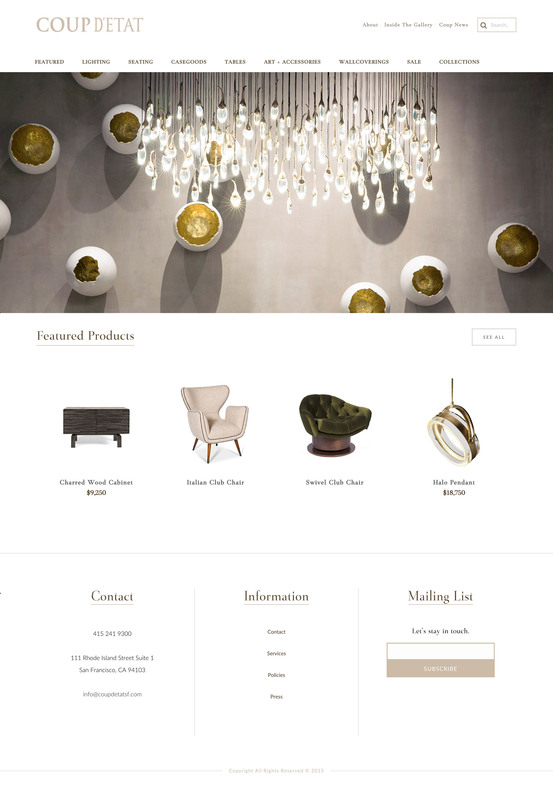 Coup D’etat in San Francisco needed a WordPress website design that reflected the quality and design of its collection. Coup has grown to become a dynamic, high-end, design gallery operating outside the traditional showroom model. 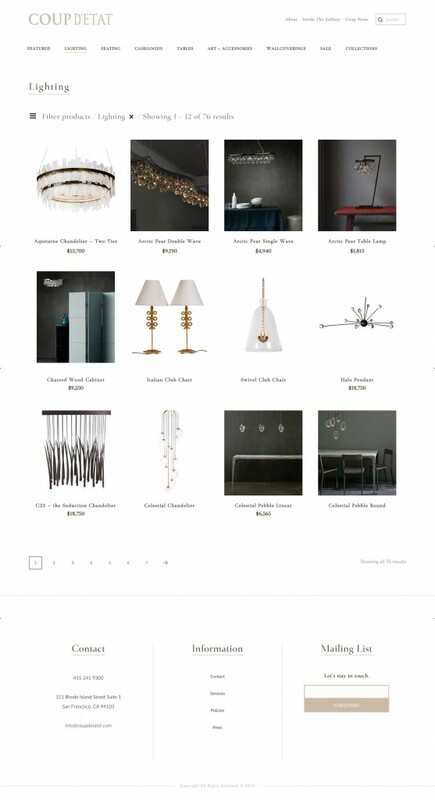 Coup offers an exceptionally curated collection that includes rare, one-of-a-kind vintage and antique items, represented lines, and select pieces from artisans around the world.Although the website is not transactional Zen Den implemented the Woocommerce eCommerce plugin to build out the catalog function. WooCommerce is now the most popular eCommerce platform on the web according to stats at (Builtwith), so our clients can rest assured they are in good company. Zen Den provided the Coup staff with the WordPress training needed to manage their new website. The user friendly admin allows the staff at Coup complete freedom to add, edit and delete pages, blog posts, images, categories and products. Each product in the Coup’s product catalog has a unique downloadable tearsheet in .pdf format. In addition, Zen Den developed a custom ‘Request More Info’ button. Users enter their contact info and an email is sent to the Coup staff with the title of the product in the subject line and the customer’s contact info. 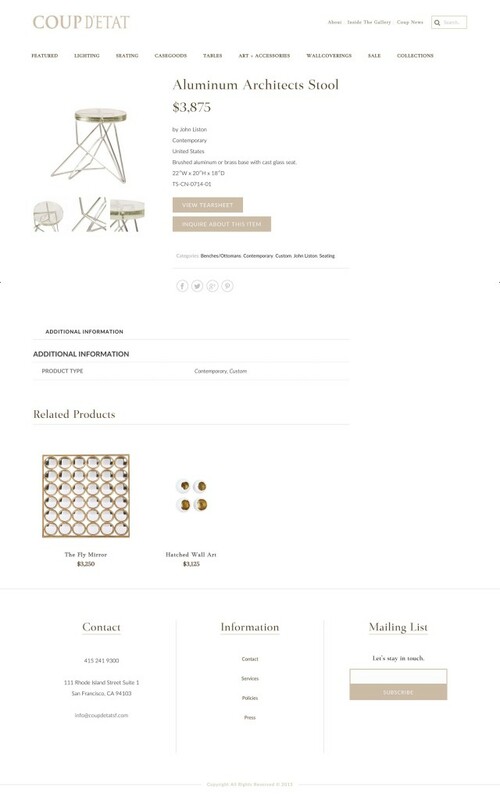 Users of the website can filter products according to the type of collection to make browsing the catalog even easier. 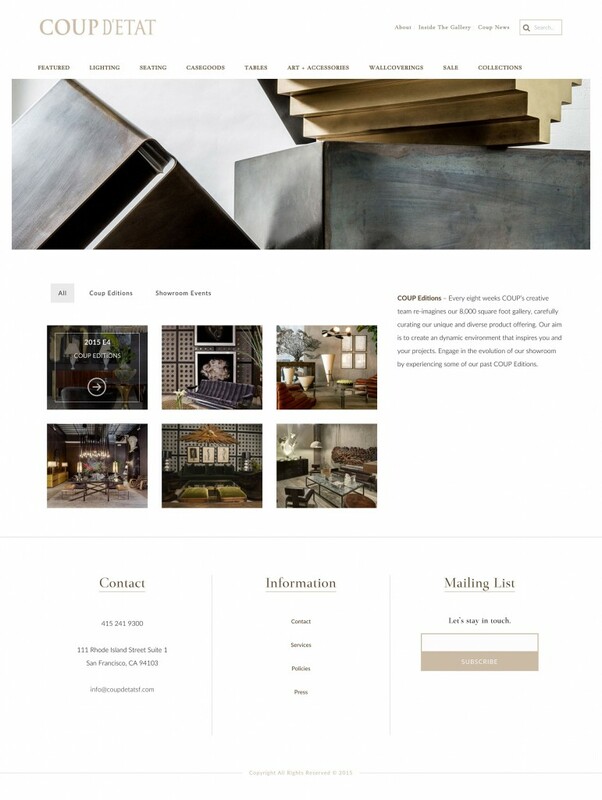 Zen Den Web Design works closely with our clients to design and build any kind of site imaginable: business site, blog, online shop, portfolio, the sky is the limit with our team of digital creatives. If your company is searching for award winning WordPress Website Design complete our request a quote form to schedule a conversation with a member of our team.